Includes quick change cartridges , supplementary booster pump optional . 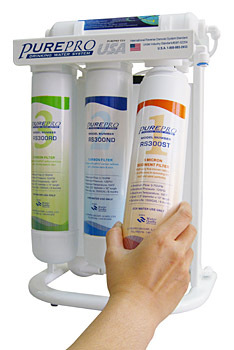 Reverse Osmosis removes all minerals and contaminants from your water. The water is also acidic and hence lacks the essential minerals for good health . Our alkaline reverse osmosis systems add the essential minerals back into the water – however minus the contaminants! More about alkaline filters. Reverse Osmosis Water Filters are by far the most popular water treatment technology in use in the world today. No equipment is more effective in helping create ideal water conditions as Reverse Osmosis (RO) units. These units filter out up to 99% of chemicals found in tap water by forcing tap water through a semi-permeable membrane that removes 95-99% of tap water impurities. An ideal solution for water sources that are too hard or unhealthy as water is first thoroughly cleaned then re-mineralised. Include high quality Dow TFC membrane technology. TFC membranes are typically made out of a thin polyamide layer (<200 nm) deposited on top of a polyethersulfone or polysulfone porous layer (about 50 microns) on top of a non-woven fabric support sheet. The three layer configuration gives the desired properties of high rejection of undesired materials (like salts), high filtration rate, and good mechanical strength. The polyamide top layer is responsible for the high rejection and is chosen primarily for its permeability to water and relative impermeability to various dissolved impurities including salt ions and other small, unfilterable molecules. Simply the best RO technology for residential RO filters. Alkaline Water For Better Health ! The only filtration in the world today that will reduce acidity in the body and it will produce natural calcium, magnesium, sodium and potassium ions that can be completely absorbed. Acid wastes (from the lifestyles we lead – not only from food and drink, but also from stress and other pollutants) are dumped into the bloodstream and lymph, and then are transported to the liver and kidneys where the detoxification process is carried out. Keep in mind that a pH of 8 and above is the only range that is beneficial to your good health. Alkaline water helps balance the body’s pH, which tends to be acidic because of our high acid food diet, stress and exposure to environmental toxins such as smog. Alkalise your body pH from acidic to alkaline pH, because cancer and many other illnesses cannot live in alkaline environments. Alkaline is the “normal” state of healthy people. Bear in mind that high pH alone is not enough, the minerals added to the water provide the buffering and alkalinity to neutralise acids. Link: Potential benefits of pH 8.8 alkaline drinking water as an adjunct in the treatment of reflux disease. Reverse Osmosis Water Filters ERS-106A are super quality 6 stage filter systems, and come with an Alkaline Filter, to offer the very best in water filtration and balanced pH water for drinking. Using reverse osmosis technologies with alkaline filter can actually remove 99.99% of contaminants and provide people with healthy alkaline drinking water. See our blog for more information about the benefits of alkaline water. The Alkaline filter changes the acidic RO water into a perfect Natural Alkaline mineral rich water. The Alkaline filter simply gives back minerals such as ionised calcium, magnesium, sodium, potassium ion, which were removed during the reverse osmosis process. 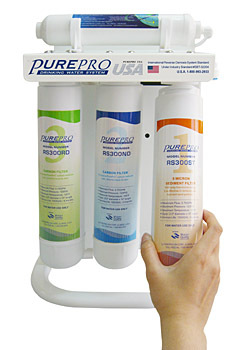 The PurePro® Alkaline filter is effective and affordable. Help minimise the fluctuations of your body’s pH. Turns acidic drinking water into mineral rich water. This natural calcium, magnesium, sodium, potassium ions can be fully absorbed by your body. Provides alkalinity to the water which otherwise would be corrosive and acidic. 12 litre NSF Standards Water Storage Tank. 100% Factory Tested and Sterilised Ready for Installation. The newly designed quick-change RO system is user friendly with design simplicity in mind. It requires no tools for filter changes. The quick-change cartridge design makes filter changes fast, clean and easy. No tools required for replacing the cartridges. This space saving allows maximum use of your under counter space. Quick change RO systems significantly reduce filter change time! Change filters with a single 1/4 turn twist! Much quicker than traditional systems! The Alkaline filter changes the acidic RO water into a perfect Natural Alkali Calcium Ionized Water. The Alkaline filter simply gives back minerals such as ionised calcium, magnesium, sodium, potassium ion, which were removed during the membrane filtration process. We warrant that this product is free of defects of both material and workmanship for a period of one year. Any product found to be defective will be replaced at no cost, except for any associated freight charges. Prior to any returns, please contact our Customer Care Service in order for us to assess your warrantee claim. We recently returned after an extended trip in South East Asia, my partner & I spent 9 months drinking filtered water over there as a matter of necessity. When we returned to Melbourne we didn’t think twice about drinking the tap water as it has the reputation of being the best in the world. We always use to drink it & never had any issues, or so we thought. On our return, my partner & I started feeling a bit queasy after a few day, I thought it may have been the flight, or the food on the plane, I had no idea why we were both feeling crook in the belly. We drink quite a lot of water, on average a minimum of two litres a day, on day five we were still feeling quite bad & as it happened I burped & when I did that I tasted chlorine, just like when your in a swimming pool. I thought how odd. I said to my partner We need to buy some bottled water. After a few days on bottled water we both started to feel normal again. I searched the internet for water filters & found Pacific Water, I went through their entire site & found that they carry a great selection of water treatment gear. I had made a decision on what I wanted for home, telephoned Pacific Water to clarify some details & I have to say, the on the phone service was excellent, the man on the other end was very helpful, he new his product & even modified it in order to send a filtered feed to my coffee machine. We now have RO filtered water that has been PH modified on tap. It tastes amazing, the coffees are actually better. I cannot recommend this unit enough. I honestly think that the chlorine in our drinking water affects our gut bacteria & impacts it in a negative manner, These RO filters are an absolute must for any health conscious individual & their family.